Focal inflammation in a female B6C3F1 mouse from a subchronic study. 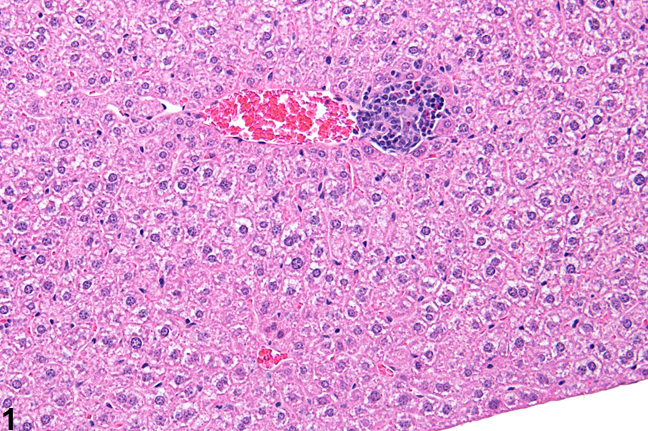 Focal inflammation in a female B6C3F1 mouse from a subchronic study (higher magnification of Figure 1). Focal inflammation in a female Swiss Webster mouse from a subchronic study. 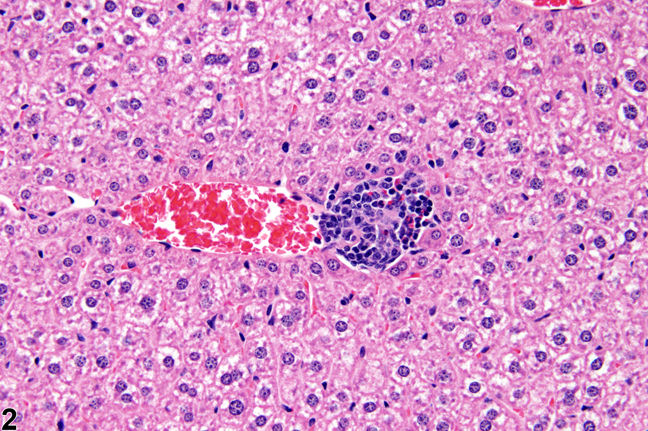 Focal inflammation in a female Swiss Webster mouse from a subchronic study (higher magnification of Figure 3). Focal inflammation in a female F344/N rat from a subchronic study. 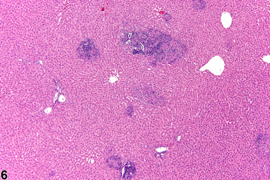 Granulomatous inflammation in a female F344/NTac rat from a subchronic study. Granulomatous inflammation in a female F344/NTac rat from a subchronic study (higher magnification of Figure 6). 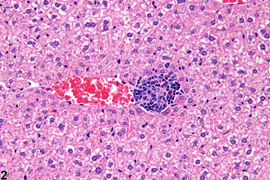 Inflammation, focal is the term used to denote single or multiple, focal, randomly distributed aggregates of inflammatory cells that are seen in the liver as a background lesion and are more frequent in aging mice and rats than in young animals. 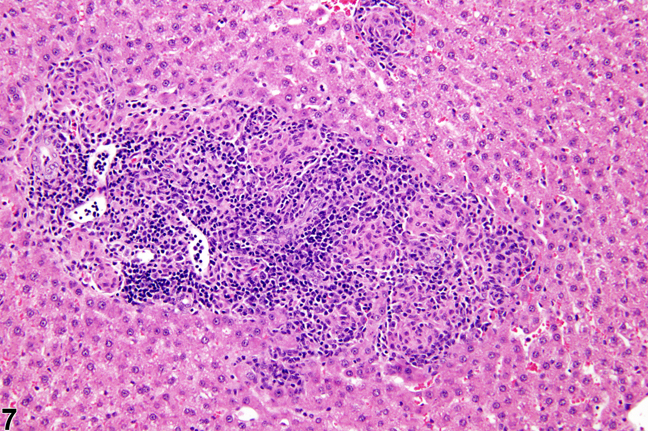 However, these foci of inflammatory cells can occur spontaneously in livers of rodents in prechronic studies ( Figure 1 and Figure 2 ). 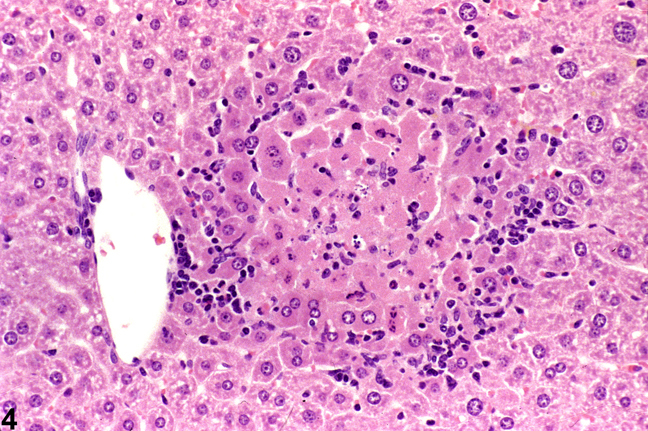 The infiltrating cells are predominantly lymphocytes but may include fewer numbers of neutrophils and/or macrophages. 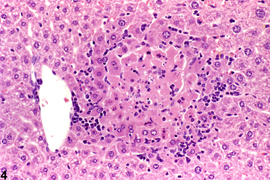 Inflammatory cell aggregates may be accompanied by evidence of hepatocellular necrosis ( Figure 3 and Figure 4 ). These foci may vary in size ( Figure 6 and Figure 7 ) but typically are not grossly apparent. These lesions may be more common in females (Harada et al. 1996) and may be related to infectious agents (Hall et al. 1992). Most often the cause is unknown. If only one or two foci of inflammation are seen in the standard histologic sections, the severity grade would be 1+ (minimal). Xenobiotic exposure may also increase the severity and/or number of these lesions compared with concurrent controls. Other less common forms of inflammation include acute, suppurative, and granulomatous inflammation. In acute inflammation, neutrophils are the predominant infiltrating cell, though fewer macrophages and lymphocytes may also be present, as well as evidence of edema or hyperemia. In suppurative inflammation, neutrophils are also the predominant infiltrating cell type but they are aggregated, and many are degenerate. Cell debris from both the resident cell populations and infiltrating leukocytes may also be present in the exudate, as well as proteinaceous fluid containing fibrin, a few macrophages, occasional lymphocytes or plasma cells, and possibly an infectious agent. Grossly, these lesions would be characterized by the presence of pus. The tissue surrounding the exudate may contain fibroblasts, fibrous connective tissue, and mixed inflammatory cells, depending on the chronicity of the lesion. 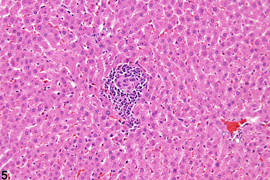 Granulomatous inflammation is another form of chronic inflammation whose diagnosis requires the presence of a significant number of aggregated, large, activated macrophages, epithelioid macrophages, and/or multinucleated giant cells. Inflammatory lesions that are morphologically consistent with the above description of focal inflammation should be recorded as “inflammation, focal” whether or not they are related to treatment. The severity grades should reflect any treatment-related differences between groups. One or two small focal inflammatory cell aggregates in controls in the absence of any exacerbation, increase, or decrease in treated groups is considered a background lesion. If it is not documented in a specific study, the pathology narrative should indicate that it was occasionally seen without any differences among study groups. If it is documented in a study, it should be consistently recorded and graded whenever seen. Because this lesion is associated with aging, its occurrence in 28- or 90-day studies may warrant documentation. If an inflammatory lesion is present that differs in some qualitative manner (morphology, distribution, etc.) from the above description of focal inflammation, one of the other diagnostic terms described above may be used. However, because focal inflammation is such a common lesion and may be present concurrently with another type of inflammation, these lesions must be thoroughly described in the narrative so that they may be clearly differentiated from focal inflammation. 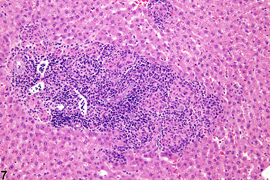 The term “inflammation” should be used in reference to leukocytes, but “infiltration, cellular” may be used when nonleukocytic cells are present in the liver (e.g., mast cells). 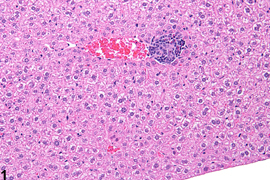 All of these lesions should be graded based on the extent of liver involvement. 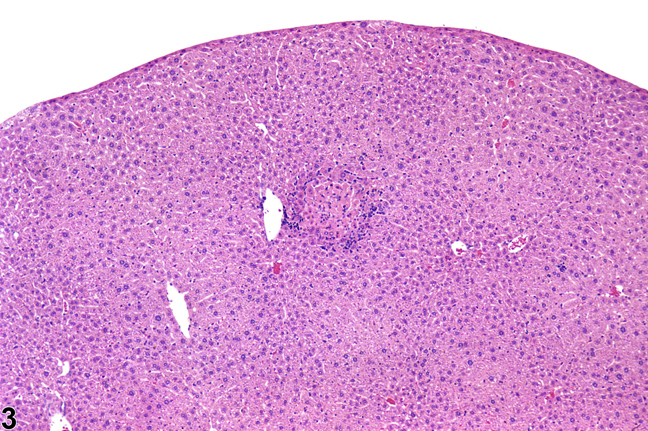 Morphologic features such as the distribution pattern can be presented in the pathology narrative. 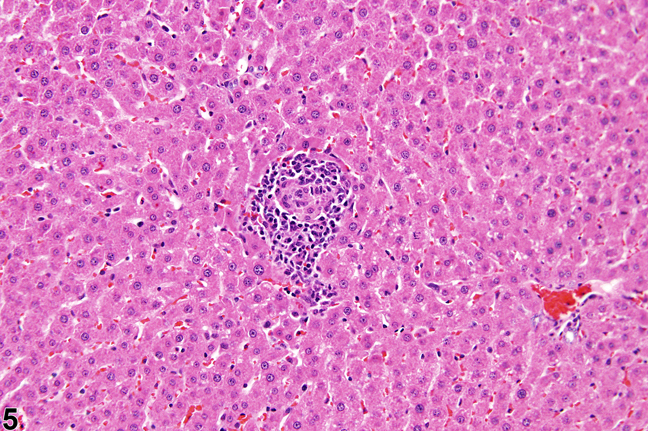 Any associated changes, such as hepatocyte degeneration, necrosis, pigmentation, or vascular changes, may be diagnosed as a separate lesion if warranted by the severity of these associated lesions. Hall WC, Ganaway JR, Rao GN, Peters RL, Allen AM, Luczak JW, Sandberg EM, Quigley BH. 1992. Histopathologic observations in weanling B6C3F1 mice and F344/N rats and their adult parental strains. Toxicol Pathol 20:146-154. Harada T, Maronpot RR, Enomoto A, Tamano S, Ward JM. 1996. Changes in the liver and gallbladder. In: Pathobiology of the Aging Mouse (Mohr U, Dungworth DL, Capen CC, Carlton WW, Sundberg JP, Ward JM, eds). ILSI Press, Washington, DC, 2:207-241.